New in 2018. Ultra spacious luxurious lodge with one double with ensuite bath or shower and two twin (doubles by arrangement). Bathroom with bath and overhead shower. 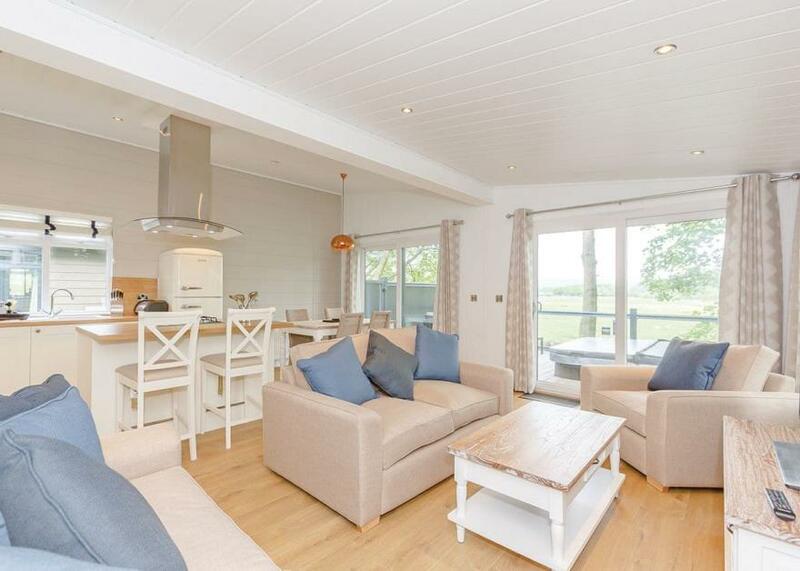 Modern, well equipped open plan living, kitchen and dining area with doors leading to decking with quality garden furniture and outdoor hot tub.. Aysgarth Lodges is part of our Evermore Lodge Holidays Collection, the epitome of stylish relaxation in the heart of the Yorkshire Dales. Found in a secluded spot on the banks of the picturesque Bishopdale Beck, Aysgarth Lodges is within walking distance of the famous Aysgarth Falls, the three stepped waterfalls which have been a tourist attraction for over 200 years and more recently provided the stunning backdrop to the Hollywood movie Robin Hood Prince of Thieves. 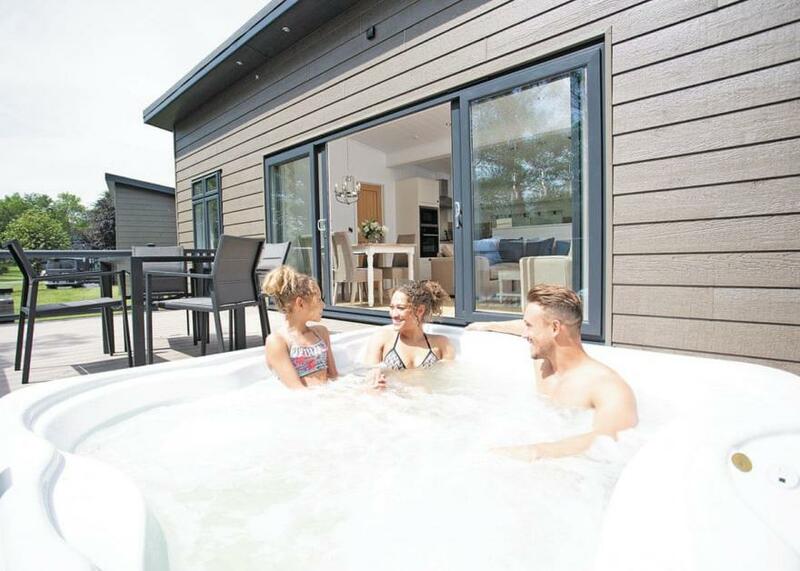 Aysgarth Lodges combines luxury with the ultimate in sophistication in this collection of chic lodges each with its own hot tub ideal for soaking up the Wensleydale views. As the perfect complement to your holiday experience the new Falls End bar and restaurant is available to take advantage of the best of Yorkshire’s famous hospitality. If you chose to leave the serenity of your lodge, onsite there is a petting farm, always a treat for big and little children alike! The very best Yorkshire has to offer is on your doorstep, Aysgarth and the falls are one mile away or travel a little further afield and you’ll discover Castle Bolton, Richmond Castle White Scar Caves and Hadraw Falls all set in the spectacular scenery of the Yorkshire Dales.. Aysgarth Lodges is part of our Evermore Lodge Holidays Collection, the epitome of stylish relaxation in the heart of the Yorkshire Dales. Found in a secluded spot on the banks of the picturesque Bishopdale Beck, Aysgarth Lodges is within walking distance of the famous Aysgarth Falls, the three stepped waterfalls which have been a tourist attraction for over 200 years and more recently provided the stunning backdrop to the Hollywood movie Robin Hood Prince of Thieves. Petting Farm. All facilities available for all dates. New in 2018. 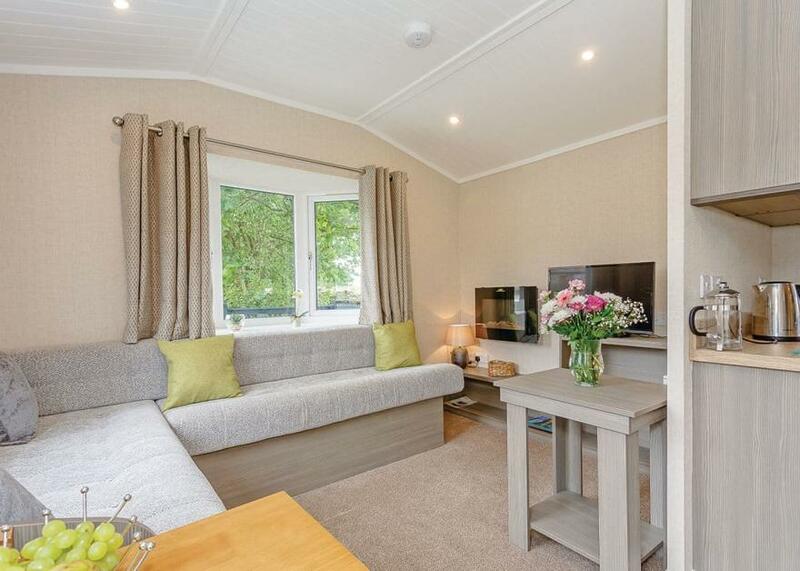 Cosy and contemporary semi-detached lodge with one double with ensuite shower. 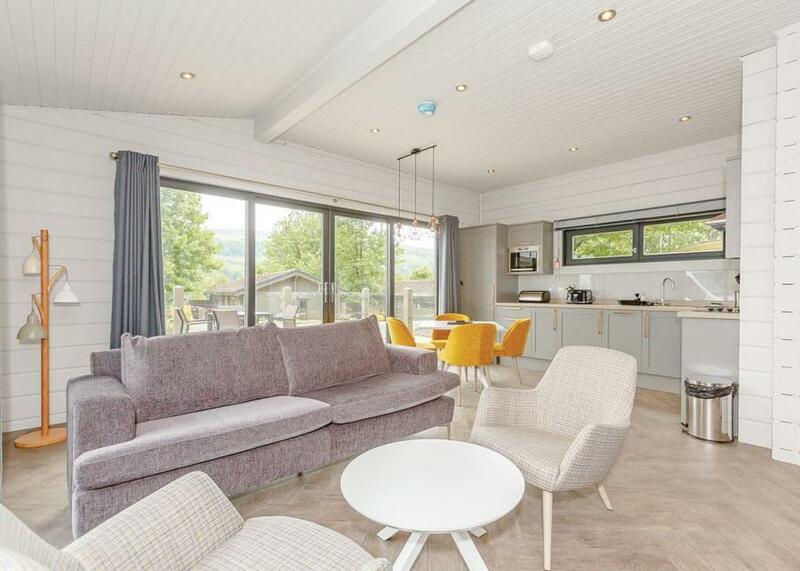 Modern, well equipped open plan living/kitchen area leading to decking area with quality garden furniture and outdoor hot tub.. Aysgarth Lodges is part of our Evermore Lodge Holidays Collection, the epitome of stylish relaxation in the heart of the Yorkshire Dales. Found in a secluded spot on the banks of the picturesque Bishopdale Beck, Aysgarth Lodges is within walking distance of the famous Aysgarth Falls, the three stepped waterfalls which have been a tourist attraction for over 200 years and more recently provided the stunning backdrop to the Hollywood movie Robin Hood Prince of Thieves. New in 2018. Stunning luxurious lodge with master double with ensuite bath with overhead shower and one double and two twin (doubles by arrangement). Family shower room. 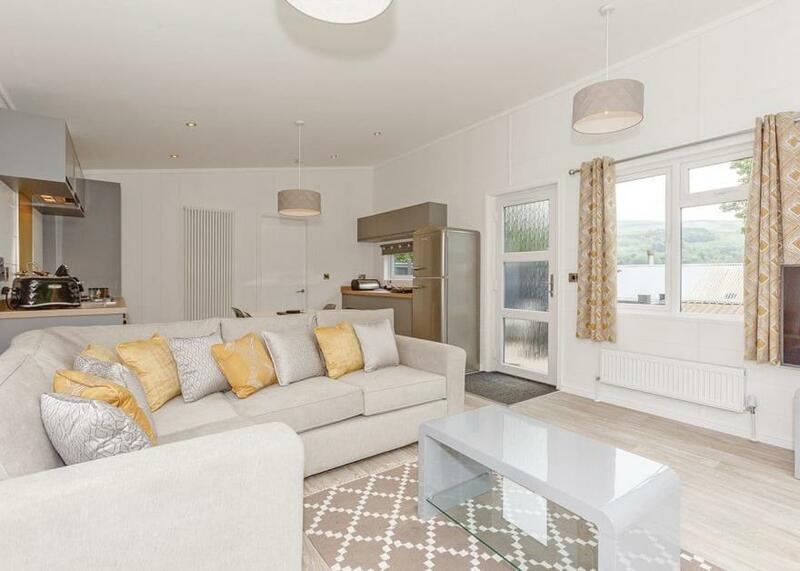 Modern, well equipped open plan living, kitchen and dining area with doors leading to decking area with quality garden furniture and outdoor hot tub.. Aysgarth Lodges is part of our Evermore Lodge Holidays Collection, the epitome of stylish relaxation in the heart of the Yorkshire Dales. Found in a secluded spot on the banks of the picturesque Bishopdale Beck, Aysgarth Lodges is within walking distance of the famous Aysgarth Falls, the three stepped waterfalls which have been a tourist attraction for over 200 years and more recently provided the stunning backdrop to the Hollywood movie Robin Hood Prince of Thieves. New in 2018. Ultra spacious luxurious lodge with one double with ensuite bath or shower and one twin (double by arrangement). Bathroom with bath and overhead shower. 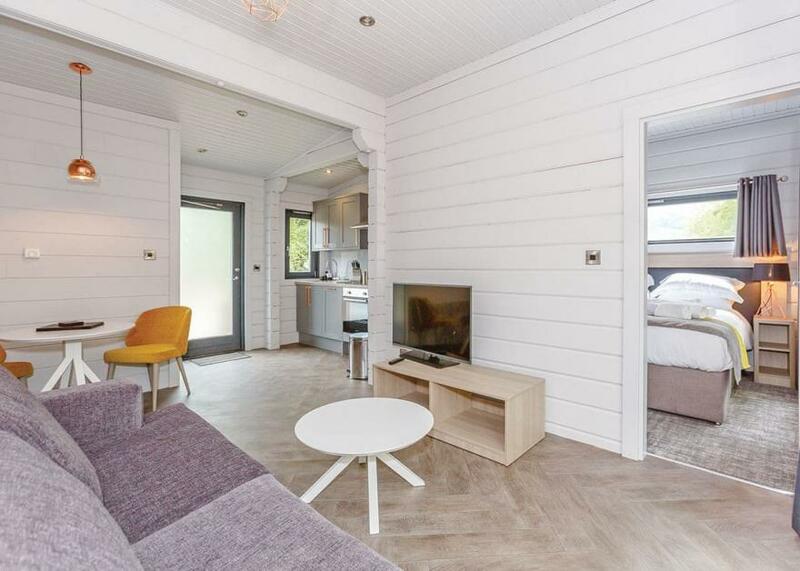 Modern, well equipped open plan living, kitchen and dining area with doors leading to decking with quality garden furniture and outdoor hot tub.. Aysgarth Lodges is part of our Evermore Lodge Holidays Collection, the epitome of stylish relaxation in the heart of the Yorkshire Dales. Found in a secluded spot on the banks of the picturesque Bishopdale Beck, Aysgarth Lodges is within walking distance of the famous Aysgarth Falls, the three stepped waterfalls which have been a tourist attraction for over 200 years and more recently provided the stunning backdrop to the Hollywood movie Robin Hood Prince of Thieves. New in 2018. Ultra spacious contemporary lodge with one double with ensuite shower and two twin (doubles by arrangement). Family shower room. Open plan kitchen, living and dining area with log burner. Decking with quality garden furniture and outdoor hot tub. Aysgarth Lodges is part of our Evermore Lodge Holidays Collection, the epitome of stylish relaxation in the heart of the Yorkshire Dales. Found in a secluded spot on the banks of the picturesque Bishopdale Beck, Aysgarth Lodges is within walking distance of the famous Aysgarth Falls, the three stepped waterfalls which have been a tourist attraction for over 200 years and more recently provided the stunning backdrop to the Hollywood movie Robin Hood Prince of Thieves. New in 2018. Spacious contemporary lodge with one double with ensuite shower and one twin (double by arrangement). Family shower room. Open plan kitchen, living and dining area with log burner. Decking with quality garden furniture and outdoor hot tub. Aysgarth Lodges is part of our Evermore Lodge Holidays Collection, the epitome of stylish relaxation in the heart of the Yorkshire Dales. Found in a secluded spot on the banks of the picturesque Bishopdale Beck, Aysgarth Lodges is within walking distance of the famous Aysgarth Falls, the three stepped waterfalls which have been a tourist attraction for over 200 years and more recently provided the stunning backdrop to the Hollywood movie Robin Hood Prince of Thieves. New in 2018. Spacious and contemporary lodge with one double with ensuite shower and one twin (double by arrangement). Family shower room. Open plan living, kitchen and dining area. 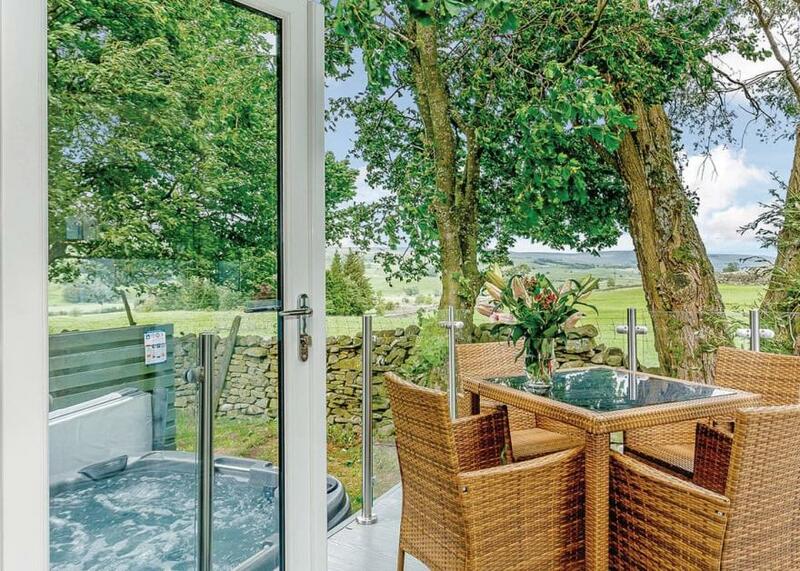 Doors leading to decking with quality garden furniture and outdoor hot tub.. Aysgarth Lodges is part of our Evermore Lodge Holidays Collection, the epitome of stylish relaxation in the heart of the Yorkshire Dales. Found in a secluded spot on the banks of the picturesque Bishopdale Beck, Aysgarth Lodges is within walking distance of the famous Aysgarth Falls, the three stepped waterfalls which have been a tourist attraction for over 200 years and more recently provided the stunning backdrop to the Hollywood movie Robin Hood Prince of Thieves. New in 2017. Modern and contemporary 14ft-wide lodge style holiday home. Master double with ensuite shower and one twin. Bathroom with bath and overhead shower. Open plan lounge/kitchen/diner. Double glazed and heated throughout. 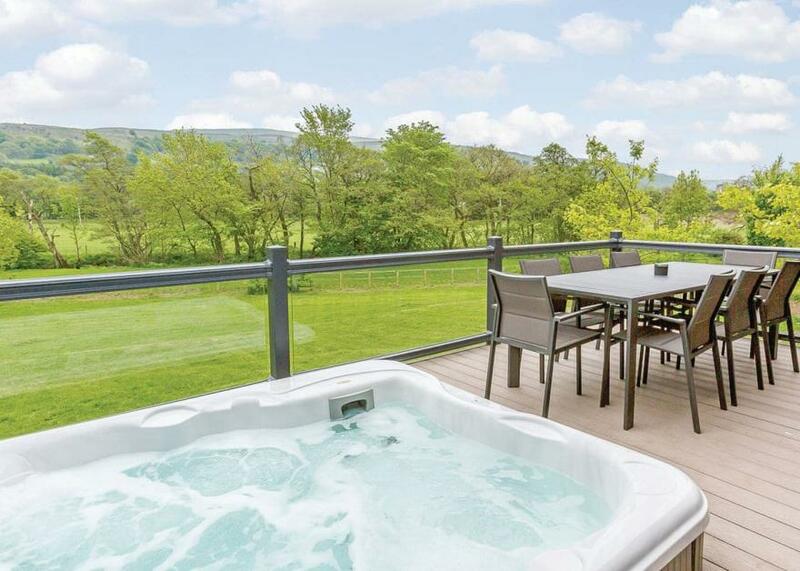 Decking with garden furniture and outdoor hot tub.. Part of our exclusive Bouja Boutique range, Bainbridge Ings is set in the beautiful Yorkshire Dales enjoying panoramic views of the magnificent Wensleydale landscape. The pretty market town of Hawes, with its good selection of shops, cafés, restaurants, pubs, Wensleydale Creamery, rope makers and museum is just a 10 minute walk away. The site is well placed for walking, or visiting nearby Hardraw Force Waterfall, local caves and castles. Being only half a mile from the Pennine Way makes Bainbridge Ings the perfect location to base yourself for a walking tour of the Dales. The Lake District is a 30 minute drive away. Stylish and bursting with country chic, these superb homes offer a spacious and contemporary home from home with open plan living and dining areas leading to private verandahs; perfect for soaking up the spectacular views. Wi-Fi access is available in the reception area. . Part of our exclusive Bouja Boutique range, Bainbridge Ings is set in the beautiful Yorkshire Dales enjoying panoramic views of the magnificent Wensleydale landscape. Wi-Fi access is available in the reception area. . Located within the Lake District National Park and just a 5 minute walk from Ullswater and the stunning little village of Pooley Bridge, Hillcroft Park is an idyllic location from which to explore the Lake District and the Eden Valley. New in 2017. Modern and contemporary 14ft-wide lodge style holiday home. Master double and one twin both with ensuite shower. Open plan lounge/kitchen/diner. Double glazed and heated throughout. Decking with garden furniture. No pets.. Part of our exclusive Bouja Boutique range, Bainbridge Ings is set in the beautiful Yorkshire Dales enjoying panoramic views of the magnificent Wensleydale landscape. Wharfe Lodge is a detached log cabin in a secluded corner of the Long Ashes Leisure Park just two miles from Grassington in the Yorkshire Dales National Park. 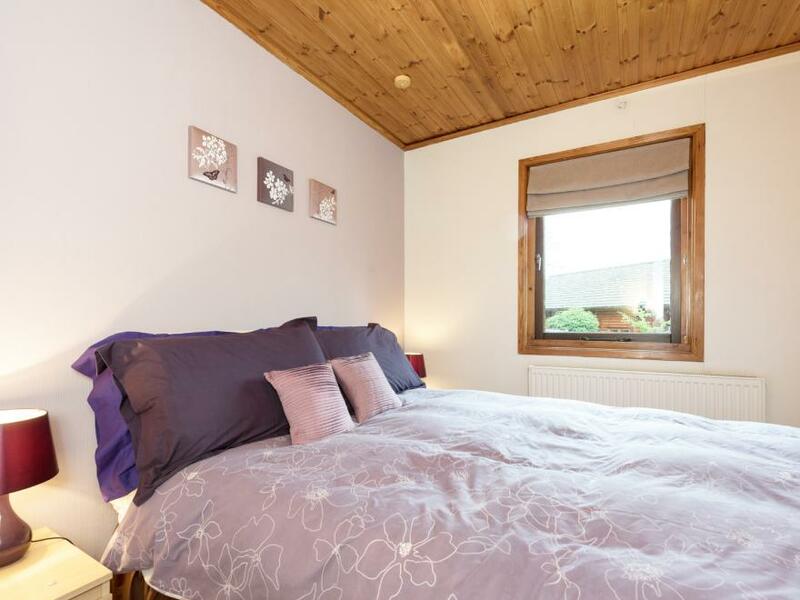 With one double and one twin bedroom as well as a family bathroom, this cottage can sleep four people. Also included are a fitted kitchen with a dining area and a sitting room with a balcony. To the outside of the cottage is a garden area with a barbecue and plenty of off road parking. With on-site facilities such as an indoor swimming pool, gym, sauna and Jacuzzi at extra charge, Wharfe Lodge is a fantastic family holiday home in the centre of the Yorkshire Dales National Park.